Tarpon: They are also know as "Silver Kings" because when they jump the water reflects off their large scales. They begin to show up in Boca Grande Pass and Charlotte Harbor in May. May - June fish form spawning schools and go offshore to spawn. After spawning tarpon will move to the harbor to feed on threadfins and lady fish. 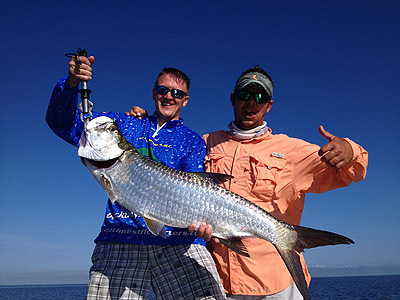 Tarpon are a summer fish that are best targeted in Charlotte harbor from May till September. Different times of the season they can be found in different locations. Early in the season late May and June the beaches and passes are the better fishing, they can weigh from 30 - 180lbs. Later in the season big schools move into the harbor. Tarpon are also known as scavengers and will take cut bait, but its all about location the beach and pass use crabs, shrimp, pinfish, or herring. Harbor use herring, ladyfish, or pinfish. Primarily inshore fish, preferring shallow estuaries around mangrove forests, salt marshes or hard-bottom/seagrass communities of the Keys. They tolerate a wide salinity range, and as juveniles, enter fresh waters. Tarpon can gulp air and remove oxygen by means of lung-like tissue near their swim bladder. This "rolling" effect is one way to spot tarpon. Anglers catch tarpon that weigh 40 to 150 pounds on average. Tarpon do not mature until 7 to 13 years of age. They spawn offshore between May and September. Live shrimp or pinfish make good baits, but plastics and Keys-style streamers work too. When sight fishing, land your presentation softly in front of a tarpon at an angle that lets you withdraw your lure away from the tarpon. Tarpon are not eaten. A tarpon tag is required for harvest.